Click here to order What NOT to Give Your Mom on Mother's Day. Young Esther has earned a special gragger (whirling noisemaker) by delivering charitable gifts on Purim, a Jewish holiday based on the story of Queen Esther. Now she is ready to carry her gragger in the festive Purim parade! Like the legendary Queen, Esther displays courage and wit when an older bully tries to steal her gragger. The lively cast of characters quibble and carouse in a bygone world of warmth, surprise, and generosity. There is even a parade for children only. The appendix helps readers understand the history of Purim, how it is celebrated today, what a “gragger” is, and how to make a simple noisemaker. 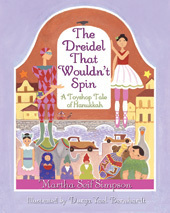 Following the award-winning The Dreidel That Wouldn't Spin, author Martha Seif Simpson and illustrator D. Yael Bernhard have again created a new toyshop tale of playful language and images that hint at ancient roots and hidden meanings, which are just waiting for young readers to find. “This dreidel doesn’t work!” the father cried. “What do you mean? How can a dreidel not work?” the shopkeeper asked. In this beautiful holiday story, the happiness and joy of the Hanukkah miracle will warm the heart of young and old alike with its simple message: wonders still occur for those who are ready for them. Included is a useful appendix that explains Hanukkah, and an explanation on how to play the dreidel game. Look what the NY Journal of Books says about The Dreidel Thae Wouldn't Spin! What makes a good Mother's Day present? How about some worms, a rotting log, a mud puddle, or mosquitoes? Probably not unless she is a bird, a salamander, a pig, or a bat. A little boy advises what NOT to give, and comes up with the perfect gift. Encouraging the collaboration of professionals in public libraries and local schools, this comprehensive guide presents a detailed framework for a versatile program of class visits. 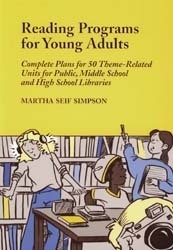 The book addresses procedures, planning and implementation, and offers suggestions for both elementary and secondary school visits. Informational packets and other print materials are provided for each level. Possible challenges are discussed, with thoughts on their impact on the overall program and ways to find workable solutions. The appendices contains easily adaptable templates including sample schedules, letters to teachers and evaluation forms. StoryCraft is an award-winning library program that combines storytelling with crafts in an exciting and engaging activity for children in first through third grades. Each program includes storytelling, a craft, movement, activities, music, and discussion. Children need to keep their minds active during school vacation to avoid the dreaded "summer slide" - forgetting what they learned during the school year. Librarians and teachers know that the best way to do that is by providing a fun-filled summer reading program that will get kids into the public library. 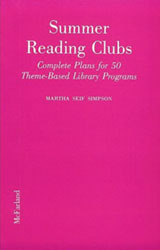 Here are plans for 50 successful summer reading programs for children in grades K-7 that will guarantee a summer full of fun, activity, and reading!